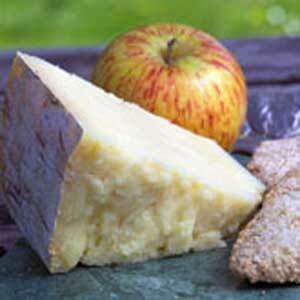 Smoked over whisky barrel shavings for a smoky cheddar taste you'll adore. Smoked cheeses are prized by cheese lovers as they combine great tasting cheese with that smoky rich flavor only a long cold smoking can impart. Connage Highland Dairy sends their award winning aged cheddar to the Summer Isles Smoke House to give their organic dunlop cheddar the rich yellow color and lovely whisky smoked flavor that only whisky barrel shavings can produce. Dunlop is the traditional Scottish version of a cheddar cheese, made in cloth bound wheels and aged on open shelves, with each wheel being turned every week to insure uniform drying and delicious flavor. 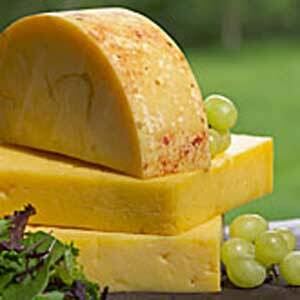 This smoked cheddar comes in 8 ounce portions vacuum packed for freshness. Connage Highland Dairy is a relatively new organic dairy outide of Ardesier in Milton of Connage. Since the Clarke family founded this dairy in 1995, they have won awards for their Clava (the soft-ripened brie), the smoked dunlop and the classic dunlop. You taste the clean fresh air of the Highlands in their cheeses.